I put together a few diagrams to show everyone what all the Window Mouldings are called, and where they are found on the 89-97 Thunderbird.. This should save us all some time..
Last edited by Rayo; 07-21-2017 at 06:02 PM. Reason: update pics.. Np..I hope it helps everyone..
Any chance of digging up the part numbers for the quarter glass moldings with the chrome for the earlier models? I know the parts are discontinued but would like to add to the list. Np..I went ahead, and added some other useful Ford Part Numbers for the earlier Thunderbirds as well.. These Part Numbers should be useful as our cars age, and we're looking for those rare parts..
By the way..Thanks for Stickying this..
wow. almost depressing seeing them all discontinued. Jason FordPartsCounter has been a reliable source for me for Ford Parts for awhile.. He's pretty good at tracking down some of the discontinued stuff as well.. This is AWESOME! It was very hard when I still had some of my molding for sale off my lemons tbird to describe what I had to a buyer to confirm that was the exact part he needed. What are folks doing for the b-pillar sticker? Mine were actually painted on, no tape. Body shop handled the upgrade! IIRC Ford did away with the Vinyl Tape on the B-Pillars starting in 94..
Of course I've heard of some MN12's with the Vinyl Tape, and some with paint..
As far as the paint goes..When Ford started painting the B-Pillars..They used Paint Code YGYA.. I cross referenced this with the PPG paint codes..The PPG Paint Code for the B-Pillar is 9741..
Any satin black trim paint will do. I used DupliColor Black Trim paint I got from the local auto parts store, it's held up well. I scuffed the surface with a scotchbrite pad before painting. Franken Cougie used Plasti Dip for a good looking job. Problem(or benefit in certain applications actually) with plastidip is it's easily removable, and can come off after a while. Best off using something like Swanny mentioned if you want it to stay looking good. I used the same stuff. Question about the door belt weather stripping, how do you treat it so the black substance doesn't rub off on everything from clothes to chamois? The Door Belt Weatherstrip like many of the black rubber/plastic exterior mouldings are prone to UV damage.. When they start to break down from UV damage..They will give off a black residue on your detailing towel..
Usually what I do when I'm detailing my Thunderbird is..Save all the cleaning of the black rubber/plastic exterior mouldings for last..
Then apply Mothers Back to Black on them..It's smeary so try to keep it on the trim/mouldings only.. I've been using the stuff for years on everything from interior to exterior black rubber/plastic pieces with great success..
As you can see most of the Thunderbird Mouldings have been discontinued so prolonging the life of them is highly recommended..
Once you start applying the Back to Black regularly you'll notice after a few times the luster of these pieces returning to what they looked like originally.. The black residue that you get on your detailing towel will never go away completely when cleaning these bits.. But the Back to Black will help preserve them, and lessen the black residue you see on your detailing towels or clothes in your case.. Thank you, I have Back to Black, but I haven't used it much. I got some on the roof drip molding and it turned it streaky white in sections, and I can't remove it. I'll be more careful, and just use it on the appropriate trim pieces. A small sponge, and rubbing alcohol should be sufficient..
That white streaking you see is probably left over wax..That needs to be cleaned off first with the rubbing alcohol.. Try to apply the Back to Black quickly so there is a UV barrier protecting your trim/mouldings.. Thanks, Rayo. I did exactly as you said and everything worked perfectly. The alcohol cleaned the old wax from the roof drip molding, and did a super job of cleaning the door belt weather stripping before I applied the Back to Black. 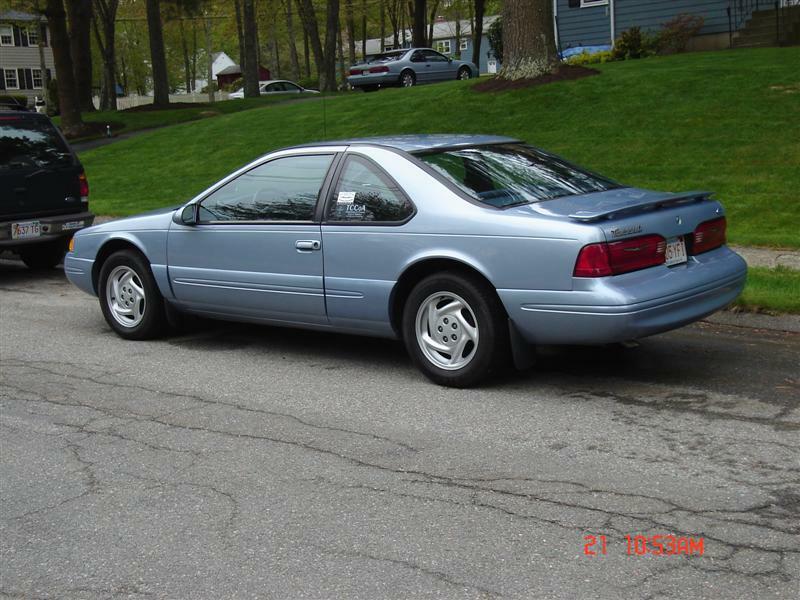 I just purchased another 97 LX. The first one is Pacific Green - this one is Dark Blue (haven't checked the code yet. The trim is black but showing chrome underneath where the black is coming off. Was this another option or is there something different on this car? It also has V8 badges on the front fenders which do not usually appear on 97's. I'm guessing the front fenders / front end has been replaced. The front bumper cover has obviously been repainted. The coating on the trim is just coming off, exposing the metal underneath. No special option on these. The V8 emblems were probably added by a previous owner. Thanks for the reply. I did find the factory part number on the left fender so I now know it is not a replacement. I need 2 doors and a right fender and found some in my local pick ur parts yard, but they are 94 or 95 models. I think the only difference is the 96-97 models have more holes for the wider body cladding. Am I correct? Can I use the earlier models and just drill additional holes for the cladding? I have a ’97 Bird 4.6, purchased new, driven daily, well-maintained and still loved. I am in Florida and have no garage or carport, so after 18 years of tropical sun I need to get it painted. The roof drip molding on both sides started to curl upward starting at door edge, it is stiff and will not go back down regardless of glue, silicone or epoxy. Pieces have curled back and broken off. I need to fix before painting. Have the part numbers above (Thank you!) but of course they are long extinct. Due to age and composition of plastic it does not seem like a removable item from a parts yard. Has anyone found a generic molding to cover the seam? Ebay is littered with chrome and fake carbon fiber strips, but they are thin adhesives made to go on top of existing moldings. The moldings are about 1/2 inch wide and fairly flat. Every aftermarket type I have found is larger. Woodman and Thunderbird Pilot 89 like this. I think SuperCoupePerformance.com has the rear window moldings. Thanks for listing this out with the pictures, very helpful. In regards to the back glass moulding (upper) and windshield moulding, is there a way to refurbish the rubber parts of them? My car has ratty mouldings (the windshield one feels rough and the back glass one is disintegrating, almost looks like shredded white fiberglass). I got a replacement back glass moulding off a junker but I don't think Back To Black will be enough (would be happy to be wrong about that). I was hoping there was an industry way of dealing with the rubber coating, sort of like re-chroming a bumper. If there is a shop or facility that I can ship them to so that they can be repaired, that would be ideal. I know what a long-shot that sounds like. I think there were a few people on here that used vinyl wrap (flat/satin black?) on them with good results. I plan to do the same. I was thinking more some sort of spray-on treatment or chemical or something to "revitalize" them. I just found a couple of them at a Pick-Your-Part that are better than what's on my car. Not great or like new, but noticeably better. I wonder if there is some sort of goo that can be applied to them so that they stay pliable, black and solid (don't disintegrate).